Catherine McGowan married Wheaton Loomis, son of Daniel Loomis and Sarah Ten Broeck, on 20 November 1835 at Oxford, NY. 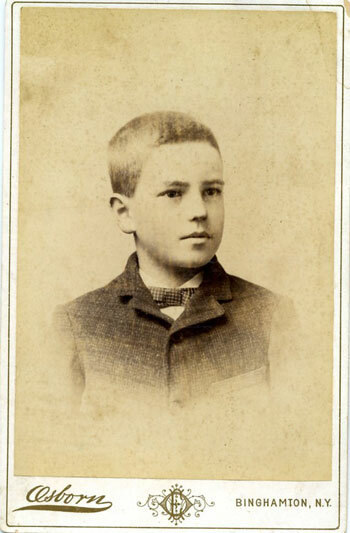 Jeremiah T. Loomis was born on 10 December 1836 at Oxford, NY. He was the son of Wheaton Loomis and Catherine McGowan. Jeremiah T. Loomis married Maria Sally Wheeler, daughter of George W. Wheeler and Malinda Crandell Hollenbeck, on 26 October 1859 at Oxford, NY. Jeremiah T. Loomis died on 17 January 1913 at Brisben, Chenango Co., NY, at age 76. Mary Alvira Loomis was born on 8 August 1838. She was the daughter of Wheaton Loomis and Catherine McGowan. Edward Loomis was born on 7 November 1841 at Oxford, NY. He was the son of Wheaton Loomis and Cynthia Tracy. Maria Sally Wheeler was born on 22 July 1839 at Greene, NY. She was the daughter of George W. Wheeler and Malinda Crandell Hollenbeck. Maria Sally Wheeler married Jeremiah T. Loomis, son of Wheaton Loomis and Catherine McGowan, on 26 October 1859 at Oxford, NY. Maria Sally Wheeler died on 19 September 1918 at Brisben, Chenango Co., NY, at age 79. Elvira M. Loomis was born on 15 March 1861. She was the daughter of Jeremiah T. Loomis and Maria Sally Wheeler. Elvira M. Loomis died on 11 November 1862 at age 1. Margaret Ross Loomis was born on 25 October 1862 at Oxford, NY. She was the daughter of Jeremiah T. Loomis and Maria Sally Wheeler. Margaret Ross Loomis died on 20 November 1862. Wheaton D. Loomis was born on 7 June 1864. He was the son of Jeremiah T. Loomis and Maria Sally Wheeler. Charlotte W. Loomis was born on 29 January 1866. She was the daughter of Jeremiah T. Loomis and Maria Sally Wheeler. Kathryn M. Loomis was born on 26 August 1869. She was the daughter of Jeremiah T. Loomis and Maria Sally Wheeler. George W. Loomis was born on 7 May 1871. He was the son of Jeremiah T. Loomis and Maria Sally Wheeler. George W. Loomis died on 4 November 1874 at age 3. Frank C. Loomis was born on 25 March 1873. He was the son of Jeremiah T. Loomis and Maria Sally Wheeler. Infant Loomis died on 16 May 1877. She was born on 16 May 1877 at Oxford, NY. She was the daughter of Jeremiah T. Loomis and Maria Sally Wheeler. William Guernsey Loomis was born on 13 June 1879 at Oxford, NY. He was the son of Jeremiah T. Loomis and Maria Sally Wheeler. William Guernsey Loomis married Belva Lockwood Manzer, daughter of Harvey Christopher Manzer and Lucetta Anne Rathbone, on 29 June 1904 at Greene, NY. William Guernsey Loomis died on 27 February 1961 at Seattle, King Co., WA, at age 81. William G. and Belva were enumerated in the 1920 Fargo, Cass Co., ND, federal census. He was 40, she was 35. Children in the household were Grace 9, Millard 3 years 3 months, and Ruth, 6 months. Myrtle L. Loomis was born on 6 March 1882. She was the daughter of Jeremiah T. Loomis and Maria Sally Wheeler. Belva Lockwood Manzer was born on 2 April 1884 at McDonough, Chenango Co., NY. She was the daughter of Harvey Christopher Manzer and Lucetta Anne Rathbone. Belva Lockwood Manzer married William Guernsey Loomis, son of Jeremiah T. Loomis and Maria Sally Wheeler, on 29 June 1904 at Greene, NY. Belva Lockwood Manzer died on 16 December 1974 at Seattle, King Co., WA, at age 90. Alberta Loomis was the daughter of William Guernsey Loomis and Belva Lockwood Manzer. Grace Elizabeth Loomis was born on 23 December 1910 at Fargo, Cass Co., ND. She was the daughter of William Guernsey Loomis and Belva Lockwood Manzer. Grace Elizabeth Loomis married Herbert Hult Hansen on 1 July 1932 at Seattle, King Co., WA. Grace Elizabeth Loomis died on 27 January 1987 at Seattle, King Co., WA, at age 76. Herbert Hult Hansen was born on 8 July 1909 at Moorehead, Clay Co., MN. He married Grace Elizabeth Loomis, daughter of William Guernsey Loomis and Belva Lockwood Manzer, on 1 July 1932 at Seattle, King Co., WA. Millard Edward Loomis was born circa 1916 at ND.1 He was the son of William Guernsey Loomis and Belva Lockwood Manzer. Ruth Maria Loomis was born on 23 June 1919 at Fargo, Cass Co., ND. She was the daughter of William Guernsey Loomis and Belva Lockwood Manzer. Ruth Maria Loomis died on 28 July 1998 at Seattle, King Co., WA, at age 79. Gideon Mills was born on 2 February 1774 at West Simsbury (now Canton), Hartford Co., CT. He was the son of Gideon Mills and Ruth Humphrey. Probably the Gideon enumerated in the 1840 Hudson, Summit Co., OH, federal census, and in the 1850 Hudson, Summit Co., OH, federal census, age 76, both times near Oliver Mills. [S160] CG Helen Schatvet Ullmann, Descendants of Peter Mills of Windsor, Connecticut, Page 251/Item 211. Oliver was enumerated in the 1840 Hudson, Summit Co., OH, federal census. There were five males in the household and three females. Oliver and Amelia were enumerated in the 1850 Hudson, Summit Co., OH, federal census. He was a farmer age 72, she was 60. Children in the household were Julia 30, and Oliver Jr. 27. [S160] CG Helen Schatvet Ullmann, Descendants of Peter Mills of Windsor, Connecticut, Page 255/Item 212. [S601] Peggy Newsome, "Oliver Mills," e-mail to James H. Holcombe Jr., 26 July 2006. Elizabeth Mills was born 15 or 16 June 1780 or 1781 at Canton, Hartford Co., CT. She was the daughter of Gideon Mills and Ruth Humphrey. Elizabeth Mills married Dr. Moses Thompson on 22 December 1797. Elizabeth Mills died on 18 November 1850. She was buried at Old Hudson Township Burying Grou, Hudson, Summit Co., OH. Helen Ullmann notes that the records for the children were from the Hudson manuscript and Ancestal File at the LDS Family History Centers. Dr. Moses Thompson was born on 22 January 1776 at Goshen, Litchfield Co., CT. He married Elizabeth Mills, daughter of Gideon Mills and Ruth Humphrey, on 22 December 1797. Dr. Moses Thompson died on 26 November 1858 at Hudson, Summit Co., OH, at age 82. He was buried at Hudson Township Cemetery, Hudson, Summit Co., OH. Eliza Le Myra Thompson was born circa 1798. She was the daughter of Dr. Moses Thompson and Elizabeth Mills. Eliza Le Myra Thompson was baptized on 4 September 1808 at Congregationalist; First Congregational Church, Hudson, Summit Co., OH. [S160] CG Helen Schatvet Ullmann, Descendants of Peter Mills of Windsor, Connecticut, Page 112. Infant Thompson was the child of Dr. Moses Thompson and Elizabeth Mills. Helen Ullmann shows a second possible marriage date and place of 11 April in Summit Co., OH. Susan Thompson was born circa 1802 at OH. She was the daughter of Dr. Moses Thompson and Elizabeth Mills. Susan Thompson married Horace Holbrook on 2 April 1839 at Portage Co., OH. Susan Thompson lived in 1850 at Northfield, Summit Co., OH. [S160] CG Helen Schatvet Ullmann, Descendants of Peter Mills of Windsor, Connecticut, Page 112/Item 213.3. Horace Holbrook was born at VT. He married Susan Thompson, daughter of Dr. Moses Thompson and Elizabeth Mills, on 2 April 1839 at Portage Co., OH. Mills Thompson was born circa 1804. He was the son of Dr. Moses Thompson and Elizabeth Mills. Mills Thompson married Catherine Allen on 31 October 1826 at Portage Co., OH. Mills Thompson married Hannah Randall. Mills Thompson lived in 1850 at Hudson, Summit Co., OH. He lived in 1860 at Hudson, Summit Co., OH. Abigail Phelps was born on 16 November 1754 at Simsbury, Hartford Co., CT. She was the daughter of Capt. David Phelps and Abigail Griswold.2 Abigail Phelps died on 17 December 1831 at Byron, Genesee Co., NY, at age 77. [S135] Judge Oliver Seymour Phelps Phelps Family, Item 1205. [S135] Judge Oliver Seymour Phelps Phelps Family, Item 1206. David Phelps was born on 13 November 1759 at Simsbury, Hartford Co., CT. He was the son of Capt. David Phelps and Abigail Griswold.2 David Phelps married Asenath Humphrey, daughter of Major Elihu Humphrey and Asenath Humphrey, before 24 March 1792. David Phelps died on 25 April 1835 at age 75. [S135] Judge Oliver Seymour Phelps Phelps Family, Item 1207. [S135] Judge Oliver Seymour Phelps Phelps Family, Item 1208. [S135] Judge Oliver Seymour Phelps Phelps Family, Item 1209. Roswell Phelps was born on 31 October 1767 at Simsbury, Hartford Co., CT. He was the son of Capt. David Phelps and Abigail Griswold.2 Roswell Phelps died on 3 April 1839 at age 71. [S135] Judge Oliver Seymour Phelps Phelps Family, Item 1210. [S135] Judge Oliver Seymour Phelps Phelps Family, Item 1211. [S135] Judge Oliver Seymour Phelps Phelps Family, Item 1212. [S135] Judge Oliver Seymour Phelps Phelps Family, Item 1213. [S258] Maud Ensign Van Meter, James Ensign, Page 52. [S101] Ruth Cost Duncan, John Case. [S59] Ruth Cost Duncan, John Case, Page 36. [S354] Martha Eunice Ensign Nelson, Ensign Record, Page 66. Hamilton Merrill was born in 1773 at Simsbury, Hartford Co., CT. He was the son of Jared Merrill and Abigail Phelps. Hamilton Merrill died in 1778 at Simsbury, Hartford Co., CT.
Mary Merrill was born in September 1775 at Simsbury, Hartford Co., CT. She was the daughter of Jared Merrill and Abigail Phelps. Mary Merrill died in May 1857 at OH at age 81.